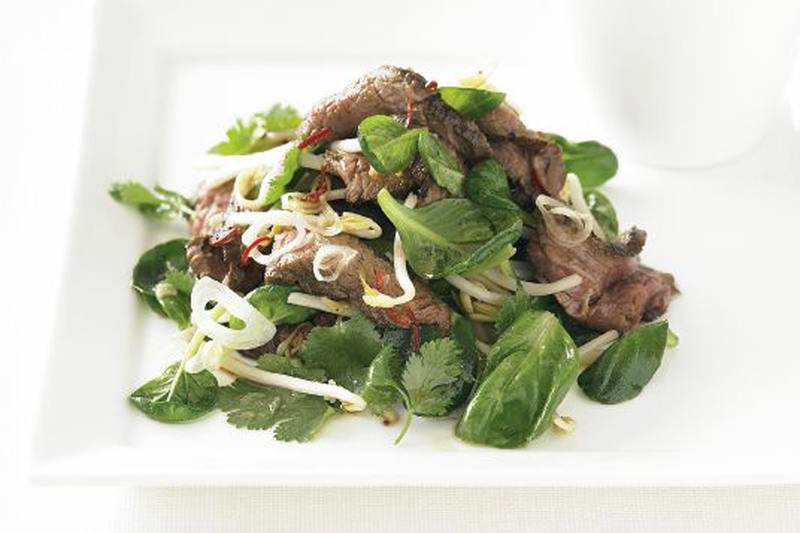 This Asian-style beef salad is high in iron and low in carbs. Cut the steak into two long strips, then toss with the soy sauce and marinate at room temperature for 5 minutes. Heat oil in a large non-stick frypan over medium-high heat. Add steak and cook for 3 minutes each side until rare and slightly charred, or until cooked to your liking. Transfer to a plate and rest for 10 minutes. Meanwhile, whisk the dressing ingredients in a large bowl. Add sprouts, onion, tatsoi and coriander. Thinly slice the beef and add to the salad, toss gently to combine and serve immediately. * Tatsoi and Asian salad leaves are from greengrocers and selected supermarkets.